For controlling power to the frog, I recommend using a SPDT switch. Newer production engines, because of all wheel pick-up, might not require the frog to be powered, but original Flyer definitely will. I have provided a wire lead for your convenience. 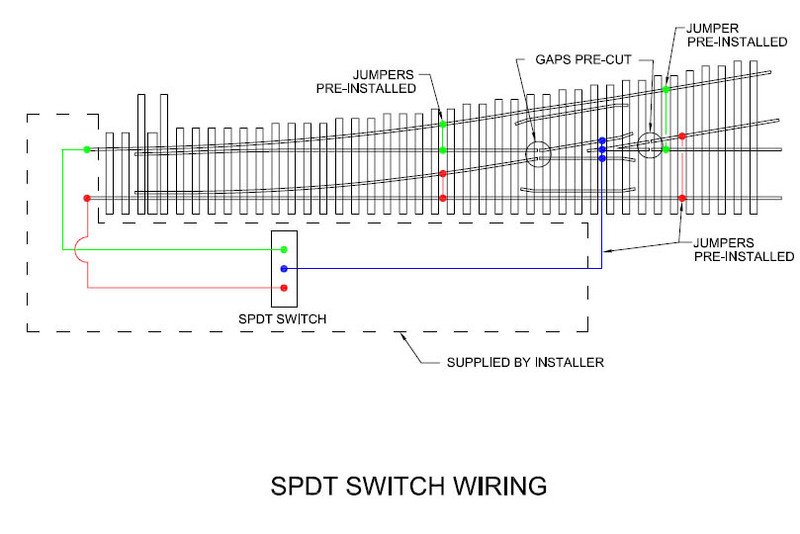 Please refer to the SPDT Switch Wiring diagram. I will be posting some pictures also. Some Flyer pilot trucks, though not all (just the cheap ones -- 282, 300 style), do not stay in gauge and I have had to shim them so they can pass through the turnout points. I use .020" styrene to make open "C" washers to slip onto the axles. Pre-drill the ties before nailing the turnout in place. Keep downward pressure on the rails as you nail. The adhesive is tough, but you can still knock a tie off, especially in the downward direction. If a tie should come off, most times I find it is the wood fiber that fails, not the adhesive. Any appropriate glue can be used to stick it back on (JB Weld, a CA gel or a wood glue). I use Tortoise switch machines or Caboose Industries H0 202S (or 101R if the throw is too stiff for the springs in the 202S) ground throws to control the turnouts. If a Tortoise Switch Machine is used, the throw wire must be up- graded. I replace the original with .039" or .042" piano wire from the hobby store. I have found .045" to be the upper limit for a Tortoise. Powdered graphite, like Kadee's 'Greas-em', on the ties improves the ease of throw. The insert is urethane. Although I test each turnout, you might want to file the insert a bit to insure smoother operation. Please view the filing video for a demo of this. File only a little at a time, it is easy to over do it.